Your life moves at the speed of light. Your work never stops. Finally a videoconference platform that is connected to everything that matters. From social channels to your office mates, Glowbl is the only web-based video platform that puts you on stage - your friends, your colleagues, your interests all at the same time. Share your news. Share your presentation. Get backstage. Get on stage with all of your friends at every stage in your day and your life. Glowbl puts you front and center. Say goodbye to flat video sharing. Create a stage, share with your friends next door or around the globe. Open the door and let life in. Glowbl lets you and your friends be in the action, a part of the show, or the whole show. 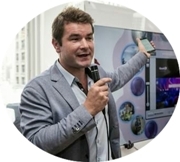 Mathieu Labey is a French entrepreneur, CEO and founder of glowbl.com located in Lyon and Paris, France and in San Francisco, CA, USA. Originally a Java, PHP and AS3 Developer, Mathieu lent his skills to a variety of private companies and research laboratories. He later relocated to Shanghai where he started his first company Guarana Spray, a web interface and application creation company. After 2 years he returned to Lyon (France) where he founded Glowbl at the end of 2011. Mathieu got his education in Cognitive sciences and advanced IT at EPITA in France. CEOCFO: Mr. Labey, would you tell us about GLOWBL? Mr. Labey: GLOWBL is a totally new, very social collaborative video conferencing system. It allows people to connect together in real-time and share whatever digital content they want online. People are also sharing the experience of the content, and the service, such as YouTube, email and SoundCloud. In addition, the platform is also excellent for business collaborations such as corporate meetings where you can use slide screen sharing. Therefore, we incorporate all of the features that you need to make a very engaging online meeting. CEOCFO: What is wrong with the traditional way? Why do we need GLOWBL? Mr. Labey: GLOWBL is making it much easier to get together and to be together. Glowbl is very simple to use because we don�t require any downloads for our users, we are simply an online platform. The second thing that makes us easy to use is the fact that the only thing you have to do in order to create an event or a meeting is to share one link with anyone that you want. Anyone who clicks on that link end up online in real-time on your meeting area/the �stage�, and they are able to connect a camera and microphone and talk with everyone. The third aspect that makes us easy and actually makes your online live more organized, is that you can invite people from social networks, such as Linkedin, Facebook, Twitter and SoundCloud. We think about social networks as �address books�. Because of this we wanted to incorporate the online social network world for people. So on Glowbl you can invite all of your networks onto our platform. We have also made it easy to share content from any of your social media channels, for example a photo album service, such as with Instagram, or your SoundCloud playlist or Twitter feed. If you want to share the pictures of your last trip that you have on Facebook, you can then talk about it together live on Glowbl. You can also connect with DropBox, which enables you to share all of your files that you have online and you do not have to open it again. You can use all of these social network services while talking together in real-time. We�re pretty excited about this ourselves and have seen people begin to realize the potential our platform offers. CEOCFO: What were the challenges in putting the technology together to make it so easy? Mr. Labey: The first challenge for GLOWBL was to create a really organic interface. We try to mimic how people in a group behave. For example, when you are in a very large conference, where you would possible have 500 people; in real life you cannot talk to 500 people and engage them as well. Therefore, on our platform people are represented by bubbles and these bubbles can connect with their neighbors. However, if you are in say, a classroom, you can talk with your neighbors, but not with everyone. That is what we represent first, which is that real way that people engage in real life. You would go to someone to talk with that person and if you wanted to talk with someone else you would have to go up to that other person. Therefore, you can move you bubble online in a virtual space that represents how you would move in real life. After that, you can have two groups of people: one group that have bigger bubbles and can talk, and the other that has smaller bubbles and can�t talk, i.e. their microphones are muted. This mirrors the situation where you have a microphone and you are on a stage, you are a �big bubble�. Everyone can listen to you and you can decide to give your microphone to random people in the audience in an organized manner. On Glowbl, although you cannot listen to everyone at the same time, everyone in the crowd, even though their bubbles are small, they can ask questions via real-time messaging, and everyone will see that message. Therefore, we can represent the basics of human behavior in group and how they communicate and engage. You can do whatever kind of event that you want, such as business conferences, concerts or social TV. Whatever event it is, people usually behave in predictable ways when they communicate in a group and Glowbl mimics that. Our capacity to be organic and real makes our platform unique. CEOCFO: How long has GLOWBL been available? Mr. Labey: We have been doing a great deal of public events in France, since the end of 2012. We opened the public platform at the end of 2013, where you can create what we call a �live stage�, which is a permanent online space with only one address. It�s kind of like having your own cafe and at any time you can invite friends to meet at that cafe. You can keep your cafe for years, or you can of course create a new cafe if you like at any time. Through Glowbl people can open a new space for friends, collaborators, fans or students, to do whatever they want to do either in private or in public since we offer two main versions of our stages. One that anyone can attend, if they know or find the URL, and another where only people who have been invited can get into the stage. CEOCFO: What has been the reception? How are people finding out and how are they making use of GLOWBL? Mr. Labey: The most unique and most common use of GLOWBL is when people need to put more than three people together at the same time, and have a conversation with some digital content. So far, it has often been trade shows, including interviews before the event. We have also seen music artists take to our platform and immediately realizing the potential for them to market themselves on Glowbl. We have seen DJs and musicians showcasing their last albums and videos to their fans and also confuting live interviews and fan club get togethers. The artist may be having a conversation with 200 people who are asking questions. We also have people who use Glowbl to share and watch videos together. People also listen to music together in real-time via our SoundCloud application. They have often been exchanging their thoughts and opinions about the music on our platform making it a very real experience again. And sometimes people share their playlists during a work day at the office. It�s been interesting to see what people have enjoyed using our platform for. Things we had not fully been able to predict. We also noticed in France that young kids that do their own fashion blogs really enjoy our platform. In addition we were not surprised to see that businesses use our platform for internal corporate meetings. We have deliberately created many features that make meetings of this kind smooth and easy. Some of those features include streamcasting, slide sharing in real-time; and our mouse-over feature, allow all participants to point to specific items in the documents and have control over the slides and other content. This allows all participants to be a lot more involved in the meetings and we have found that people enjoy the meetings more and can be more creative than if they are simply passive listeners. Finally, we also have schools that have adapted Glowbl, especially for large courses online, where the students and teachers can share with each other and ask questions. Our platform is perfect for this type of use. Therefore, we have many different users because GLOWBL is just representing the way people behave in a group at the time that they need to be together online in a group. This is when you need GLOWBL, in all those diverse situations. We think that there is no limit to the many uses people are going to come up with once they realize how fun and easy it is to use Glowbl. CEOCFO: What is or what will be your business model? Mr. Labey: When you want to do an event that is open to anyone, we call it a Public Event, it is free. We decided to not monetize this part but to encourage the use and spread of our platform this way. If, however, you want privacy or security for your stage, you would create a private event, where you invite people one-by-one, through Linkedin, email or SMS. In this case we bill people a low sum of money starting at five conference users. We bill people based on the maximum conference users that they have in the room. So, for example if you are at four as a maximum for a month in your Stage, you do not pay at all. If you are over five, then you start to pay and then you need security. CEOCFO: Have many people been taking advantage or are you still in the early stages? Mr. Labey: We have many users in France and we are now targeting the US market. We believe that the US market is more ready than the French market. The usage of video conferencing is a great deal more common over here, and is more of the norm than it is in France. The US is also so much bigger in size and companies often have offices across the country in many different states. We can bridge that gap in a new way for them. We believe that here it will be massive use of Glowbl for events, in corporate meetings, and for people connected to social media and social networks. Right now people are alone and isolated behind their computers. If you think about it, even on social networks like Facebook all users are largely experiencing the content there alone, not in real time. With Glowbl entering people�s lives we think that can really change. CEOCFO: What is the strategy to go after the US market? Mr. Labey: We have seen that we have a platform that is really good for events, where people can talk in real time about the event, and in addition give content to the community before the event. For us that seems to be a really good way to showcase the product and how our interface works and how it is really different than anything else out there. If you talk about GLOWBL without seeing the interface, you don�t really understand what makes it different. But whenever people see our platform in action, they instantly get it and usually become users of their own. Yes, there is the use of social media and various features/applications coming from different services that adds to our platform, but the interface by itself, the fact that you can move your bubble to get �physically� closer to your friends for example, is making Glowbl really human. We have seen that people understand this almost intuitively and really enjoy that aspect. Glowbl is not just a list of names, you actually see the others and you see the group. They have a bubble, and on this bubble you have their photo or the camera and you can text directly on the bubble. The bubble is really important in our concept, because it makes people begin to be physical people with a very simple avatar. That is where it is different. The strategy is to show the interface by doing events with different artists and trade-shows; whatever the community needs to engage all of the people together. We strongly believe that will be the best way to make it happen. CEOCFO: Are you funded for the next steps? Will you be seeking investors or partnerships? Mr. Labey: We are looking for further funding. We will go back to the VCs (venture capitalists) around the end of October or the beginning of November. Right now we are just opening the US market, so we need to show the US market that GLOWBL is a cool, engaging and very different media. We say that it is a �real social TV�, because with GLOWBL, people can have their own private TV station, showing and sharing and taking in content from video, webcams or YouTube. On Glowbl, whatever digital content you have on the internet is in real-time. Therefore, you can do a live event based on the internet content you choose. As is clear by now, we are really different than the many other platforms that are doing just corporate meetings that you can find on WebEx or GoToMeeting. To sum it up, in addition to the uniquely human, organic and deeply engaging aspects of Glowbl, we also make it very simple, for our users, and of course, we have found new solutions to minimize bandwidth consumption making it possible for an unlimited amount of users to attend the same event without overwhelming the platform in any way. CEOCFO: What, if anything, has changed from your original concept or that you have learned along the way? Mr. Labey: This is a good question. I actually started with music in mind, with the simple idea of doing live streaming. In 2007, the concept appeared and I was doing the proof of concept with the goal of streaming music. At the time, I did a great deal of reflection and what I decided to do was to put a stage for the streaming and then people around it. I figured the participants watching the stream would engage start talking and have a fun time. The reality though, was very different. It turned out that the platform almost exactly mirrored a live event like a music concert. So, I learned early on that streaming won�t engage people to interact. Instead it makes people passive and mute which is the opposite of what I envisioned and hoped for. I realized that this is how the real world works. For example, if you rent a hall to make a trade-show, but you do not engage people to stop and connect together, your event will not be successful. Therefore, we quickly learned that to do successful events, we always need a skilled moderator to lead the event. So, now when we do events, we always have a moderator or manager, someone that is really making things happen. Much like radio stations have done all along. You need a skilled journalist, to lead, begin to share content and engage the audience, someone that gets people talking and helps encourage people to share and join in the conversation. Finally, I understood that my vision was really working, because the platform now works exactly as real life. It did all along, we just had to discover what the platform needed from us in order to be utilized to it�s fullest potential. If you do not connect people or engage together, it will not happen. That is yet another area where Glowbl is real and organic. CEOCFO: Put it together for our readers. Why pay attention to GLOWBL today? Mr. Labey: GLOWBL is a new way to use the internet. It is something that we are sure will happen. We believe that Glowbl has the potential to really revolutionize how we interact online. We hope and believe that this will make us a lot more connected and a lot less isolated and alone. We cannot even envision where this might take us as a global society. It may have political implications, and emotional implications in people�s life. Our huge cities often make people feel alone, we think our platform can potentially break that isolation and create a fun, collective everyday life. No more suffering alone behind the glossy images on Facebook, something that has been proven to cause people to feel depressed. Instead we want people to connect and feel happy because we are social animals. It was my goal from day one to create interaction and human connection. I have succeeded in this goal. Now we just hope that we can succeed in getting the word out so that people can improve their life quality. Then I know my work is done. Something we didn�t yet get into is the fact that GLOWBL is the first platform that is trying to make a real-time collaborative application store. Anything that you find now on the internet has been done after the iPhone or iPad. Now the new kind of app store that we are trying to create, is an app store where the user can find everything and every service that exists on the internet, but this time when you use it, it is used on Glowbl in real-time and therefore in a collaborative setting with the people that you choose to engage with. For example, today, if you go to an eCommerce website, you are alone with the catalog, but tomorrow, if you use it with GLOWBL, you can be two to five hundred people selecting items together. You may be making a selection of what you would buy for a friend, an apartment or for a group. It is the same with music, videos, content and slides. The main thing is to do things together online, with everyone using the same service in real-time, with two or more people seeing the same thing in real-time. We really try to push the collaborative field to the C-market.